Microsoft and Facebook have established a Co-Packaged Optics (CPO) Collaboration with the goal of encouraging common design elements for bridging optics and ASICs. The collaboration intends to provide open specifications for design elements, including the electrical signaling interface, optical standard, optical module management interface and reliability requirements. When complete, the open specifications will enable the industry to develop a set of solutions involving switch and ASIC manufacturers, optics suppliers, CMs and others that will create the final package which can then be attached to the switch PCB. The collaboration has targeted the 51T switch generation as the tipping point for industry adoption of co-packaged optics. "The Co-Packaged Optics Collaboration will provide a customer-driven, system-level view of requirements for co-packaged optics," said Katharine Schmidtke, director, Technology Sourcing, Facebook, responsible for the company's optical technology strategy. "By sharing the specifications, we aim to develop a diverse and innovative supplier ecosystem." "Providing the industry with a customer-supported set of requirements will create a stable, cooperative environment where suppliers can address one of the optical industry's most important technical challenges," said Jeff Cox, partner director, Network Architecture, Microsoft and executive director of the CPO Collaboration. "As co-founders of the Co-Packaged Optics Collaboration, Microsoft and Facebook invite customers and suppliers to join and collaborate with us." 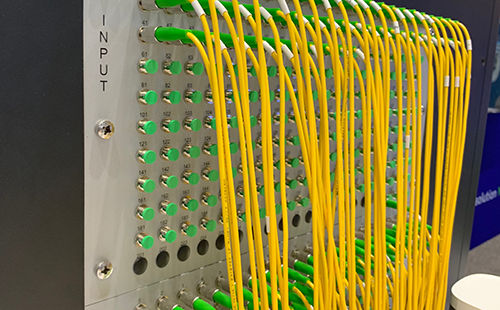 At OCP Summit 2019, Edgecore Networks introduced an open modular switch for 100G and 400G networking that conforms to the Minipack Fabric Switch design contributed by Facebook to the Open Compute Project (OCP). Minipack is a disaggregated whitebox system providing a flexible mix of 100GbE and 400GbE ports up to a system capacity of 12.8Tbps. The Minipack switch can support a mix of 100G and 400G Ethernet interfaces up to a maximum of 128x100G or 32x400G ports. Minipack is based on Broadcom StrataXGS Tomahawk 3 Switch Series silicon capable of line rate 12.8Tbps Layer2 and Layer3 switching. The Minipack front panel has eight slots for port interface modules (PIM). The first PIM options available for the Edgecore Minipack switch are the PIM-16Q with 16x100G QSFP28 ports, and the PIM-4DD with 4x400G QSFP-DD ports. The Minipack modular switch is a 4U form factor, power optimized for data center deployments, and includes hot-swappable redundant power supplies and fans for high availability. Edgecore said its Minipack AS8000 Switch enables network operators to select disaggregated NOS and SDN software options from commercial partners and open source communities to address different use cases and operational requirements. Edgecore has ported and validated Software for Open Networking in the Cloud (SONiC), the OCP open source software platform, on the Minipack AS8000 Switch as an open source option for high capacity data center fabrics. In addition, Cumulus Networks announced the availability of its Cumulus Linux operating system for the Edgecore Minipack switch. The Minipack AS8000 Switch with PIM-16Q 100G QSFP28 interface modules will be available from Edgecore resellers and integrators worldwide in Q2. PIM-4DD 400G QSFP-DD interface modules will be available in Q3. SONiC open source software, including platform drivers for the Edgecore Minipack AS8000 Switch, are available from the SONiC GitHub. 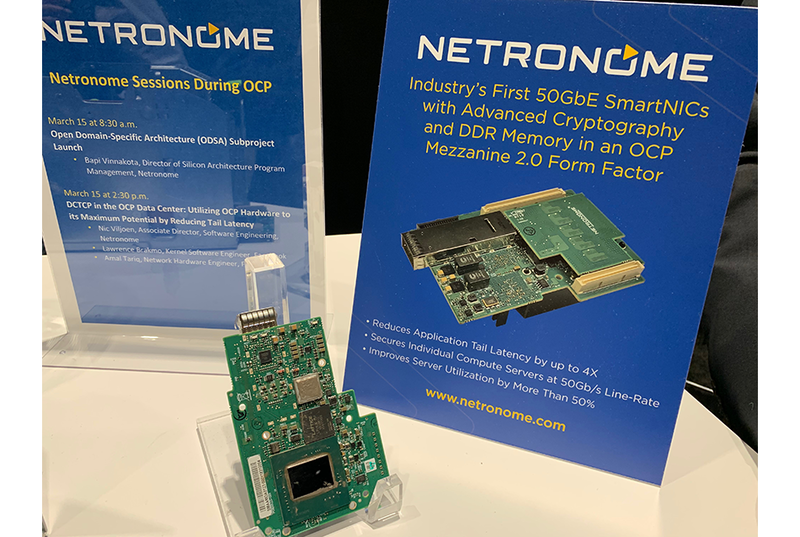 Netronome unveiled its Agilio CX 50GbE SmartNICs in OCP Mezzanine 2.0 form factor with line-rate advanced cryptography and 2GB onboard DDR memory. The Agilio CX SmartNIC platform fully and transparently offloads virtual switch, virtual router, eBPF and P4-based datapath processing for networking functions such as overlays, security, load balancing and telemetry, enabling cloud and SDN-enabled compute and storage servers to free up critical server CPU cores for application processing while delivering significantly higher performance. Netronome said its new SmartNIC reduces tail latency significantly enabling high-performance Web 2.0 applications to be deployed in cost and energy-efficient servers. With advanced Transport Layer Security (TLS/SSL)-based cryptography support at line-rate and up to two million stateful sessions per SmartNIC, web and data storage servers in hyperscale environments can now be secured tighter than ever before, preventing hacking of networks and precious user data. Deployable in OCP Yosemite servers, the Agilio CX 50GbE SmartNICs implement a standards-based and open advanced buffer management scheme enabled by the unique many-core multithreaded processing memory-based architecture of the Netronome Network Flow Processor (NFP) silicon. This improves application performance and enables hyperscale operators to maintain high levels of service level agreements (SLAs). Dynamic eBPF-based programming and hardware acceleration enables intelligent scaling of networking workloads across multiple host CPU cores, improving server efficiency. The solution also enhances security and data center efficiencies by offloading TLS, a widely deployed protocol used for encryption and authentication of applications that require data to be securely exchanged over a network. 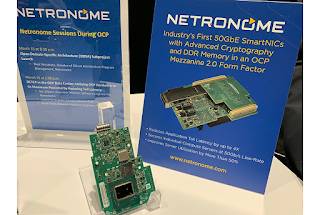 Agilio CX 50GbE SmartNICs in OCP Mezzanine 2.0 form factor are sampling today and include the generally available NFP-5000 silicon. The production version of the board and software is expected in the second half of this year. Keysight Technologies announced a joint demonstration of Ixia’s AresOne-400 Gigabit Ethernet (GE) test system and the Marvell Prestera CX 8580 Ethernet switch. The Marvell Prestera CX 8580 switch, a 12.8Tbps, 256x 50G device, is part of a new family of switches from Marvell that offers workflow visibility and analytics with its Storage Aware Flow Engine (SAFE) technology and a reduction in network layers leveraging its high radix switch core technology known as FASTER. Inspur and Intel will contribute a jointly-developed, cloud-optimized platform code named "Crane Mountain" to the OCP community. The four-socket platform is a high-density, flexible and powerful 2U server, validated for Intel Xeon (Cascade Lake) processors and optimized with Intel Optane DC persistent memory. Inspur said its NF8260M5 system is being used by Intel as a lead platform for introducing the “high-density cloud-optimized” four-socket server solution to the cloud service provider (CSP) market. 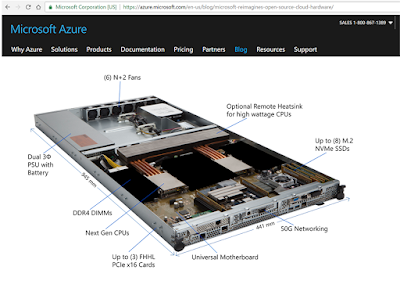 At OCP Summit 2019, Inspur also showcased three new artificial intelligence (AI) computing solutions, and announced the world’s first NVSwitch-enabled 16-GPU fully connected GPU expansion box, the GX5, which is also part of an advanced new architecture that combines the 16-GPU box with an Inspur 4-socket Olympus server. This solution features 80 CPU cores, making it suitable for deep-learning applications that require maximum throughput across multiple workloads. The Inspur NF8360M5 4-socket Olympus server is going through the OCP Contribution and OCP Accepted recognition process. Inspur also launched the 8-GPU box ON5388M5 with NVLink 2.0, as a new OCP contribution-in-process for 8-GPU box solutions. The Inspur solution offers two new topologies for different AI applications, such as autonomous driving and voice recognition. Alan Chang discusses Inspur's contributions to the Open Compute Project, including a High-density Cloud-optimized platform code-named “Crane Mountain”. This four-socket platform is a high-density, flexible and powerful 2U server, validated for Cascade Lake processors and optimized with Intel Optane DC persistent memory. It is designed and optimized for cloud Infrastructure-aaS, Function-aaS, and Bare-Metal-aaS solutions. Bob Lamb of CBTS introduces Carrier Open Infrastructure (COI), which is reference architecture based on frameworks from the Open Networking Foundation (ONF), open source hardware from the Open Compute Project (OCP) and Open Source VNFs. CBTS said its goal is to help carriers leverage open source virtual networking functions (VNFs) and common, off-the-shelf (COTS) hardware to grow revenue as broadband speeds increase and average revenue per-subscriber (ARPU) declines. The COI architecture leverages the ONF's Central Office Redefined as a data center (CORD) framework for enabling gigabit access over copper, fiber and wireless. At OCP Summit 2019, Toshiba Memory America demonstrated proof-of-concept native Ethernet NVMe-oF (NVM Express over Fabrics) SSDs. Toshiba Memory also showed its KumoScale software, which is a key NVMe-oF enabler for disaggregated storage cloud deployments. First introduced last year, Toshiba Memory has recently enhanced KumoScale’s capabilities with support for TCP-based networks. At OCP 2019, Wiwynn introduced an Open19 server based on Microsoft’s Project Olympus server specification. The SV6100G3 is a 1U double wide brick server that complies with the LinkedIn led Open19 Project standard, which defines a cross-industry common form factor applicable to EIA 19” racks. With the Open19 defined brick servers, cages and snap-on cables, operators can blind mate both data and power connections to speed up rack deployment and enhance serviceability. The FCC adopted new rules allowing for the development of new services in the spectrum above 95 GHz. interference to existing governmental and scientific operations in the above-95 GHz bands, such as space research and atmospheric sensing. CommScope and Google agreed to jointly develop, deploy and operate an Environmental Sensing Capability (ESC) network for the Citizens Broadband Radio Service (CBRS) market. CBRS spectrum is managed by Spectrum Access Systems (SASs), which require an ESC network to sense radar operation. The ESC will alert the SASs of naval radar operations so the connected SAS systems can reconfigure spectrum allocations for nearby CBRS devices to operate without interfering with naval activity. The companies said they will each provide independent SAS services and jointly operate the ESC network. The ESC network is engineered for high availability with the built-in redundancy and fault detection necessary to provide this key enabling capability. As part of this collaboration, both companies share responsibility for overall network design.